. . . and babies make four. 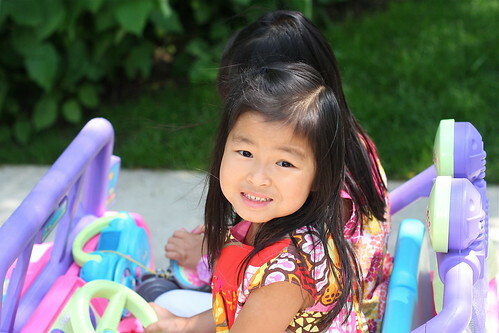 : Joy with four wheels. Guess what we found at a garage sale? Yep. 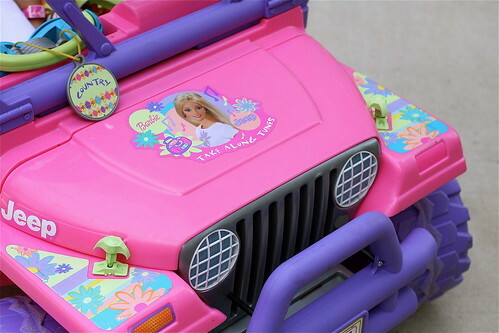 A hot pink Barbie Jeep. The girls could not be happier. It took them about three minutes to figure out how to drive it and now they zip up and down the driveway and proudly ask if I saw the Y-turn they did at the end of the driveway to turn around. Kenna is usually the driver and is particularly funny when she throws the car in to reverse, looks back over her shoulder and maneuvers the car backwards. It's a tiny glimpse of sixteen . . . oh, be still my heart. I hope you have Barbie car insurance!